The figure used for this unit is a Star Wars figure from the Alliance and Empire set. Its model number and name are 9/Han Solo on Tauntaun. The figure used for this unit is a Star Wars figure from the Battle of Hoth set. Its model number and name are 3/Han Solo on Tauntaun. Character Bio - After playing an important role in the destruction of the first Death Star, Han decided to stay with members of the Rebel Alliance. He eventually found himself on the remote planet Hoth, where the Rebels attempted to avoid being detected by the Empire. While on the icy planet, he participated in patrol duties using Speeders and indigeneous Tauntauns, the latter of which proved to be better suited for the cold. It was Solo who destroyed the Imperial Probe Droid responsible for discovering the Rebel Base. After his friend Luke failed to return from a routine patrol Han engaged in a daring and risky rescue mission to save his friend. Han's time on Hoth ended with the Imperial invasion of the Rebel Base. Being a Unique non-droid or vehicle that follows the Rebel Alliance, Han Solo may benefit from 2-1B's REBEL FIELD MEDIC special power. Han Solo may benefit from Chewbacca's WOOKIE LIFE DEBT Special Power and it's +1 defense and +1 move for Han Solo. After moving Han Solo, you may choose a friendly, small or medium figure that Han was adjacent to at any point before or during his movement that is also within 5 clear sight spaces of an opponent's figure. Place the chosen figure on any empty space adjacent to Han. Figures moved with Rescue Mission may not be placed into engagement and never take leaving engagement attacks. If Han Solo attacks a figure that was not within 5 clear sight spaces before moving, he may attack one additional time. Han may not use Aggressive Scouting and Rescue Mission on the same turn. After moving Han Solo, you may choose a friendly small or medium figure that he moved though or that was adjacent to him at any point before or during his movement. Place the chosen figure on any empty space adjacent to Han Solo. Figures moved with Rescue Mission never take leaving engagement attacks. If Han attacks a figure that has not been attacked by any other figure, you may attack that figure 1 additional time. At the end of a round, you may reveal an X order marker on this army card and heal 1 wound from an adjacent friendly figure. I tried to think of scenarios from the movie that I could incorporate into this figure. I think it worked out ok.
His scouting of the Probe Droid was certainly aggressive, and his keeping Luke alive is reflected in his Loyal Friend power. Last edited by mac122; August 6th, 2015 at 04:24 PM. Han kept Luke alive on Hoth, but didn't really heal him. What if LOYAL FRIEND prevented an adjacent friendly hero from being destroyed. Something like this, perhaps? If a friendly Unique Hero adjacent to Han Solo would take enough wounds to be destroyed, you may reveal the "X" order marker on this card to ignore any wounds. If Han attacks a figure that has not been attacked by any other figure this turn? round?, you may attack that figure 1 additional time. Though keeping track of who has been attacked could be difficult. Maybe something like "If Han attacks a figure that was not within his range when he started his turn, he may attack one additional time" ? At the end of a round, you may reveal an X order marker on this army card and remove 1 wound from an adjacent friendly figure. Would that become troublsome for a late game scenario where Han's opponent only has one hero left? What if it was "remove a unrevealed numbered order marker to prevent all wounds". Then you're not just giving up an x order marker that you're probably not using anyway, but actually giving up a turn in order to prevent damage? Has there been any thought about making Hoth Han and Tauntan Han interact, with killing the tauntan to maybe save someone, but losing movement in the process or something like that? I think this is supposed to be Tauntan Han, I didn't realize there is a Hoth Han also. I like the preventing a fig from being destroyed. That's what I was trying to get at. Yeah I knew the wording wasn't perfect. I would go with the double attack on a figure not being in range one you suggested. You could have him start with a "Tauntaun Marker" or something that gives him a boost to Move but can be removed to save a figure from dying (or generally remove wounds). Maybe make him lose Enhanced Movement. Or just a once per game power that does the same thing? Not sure what direction you really have planned in general though. @weebaer : Which figure do you want to do? Both! 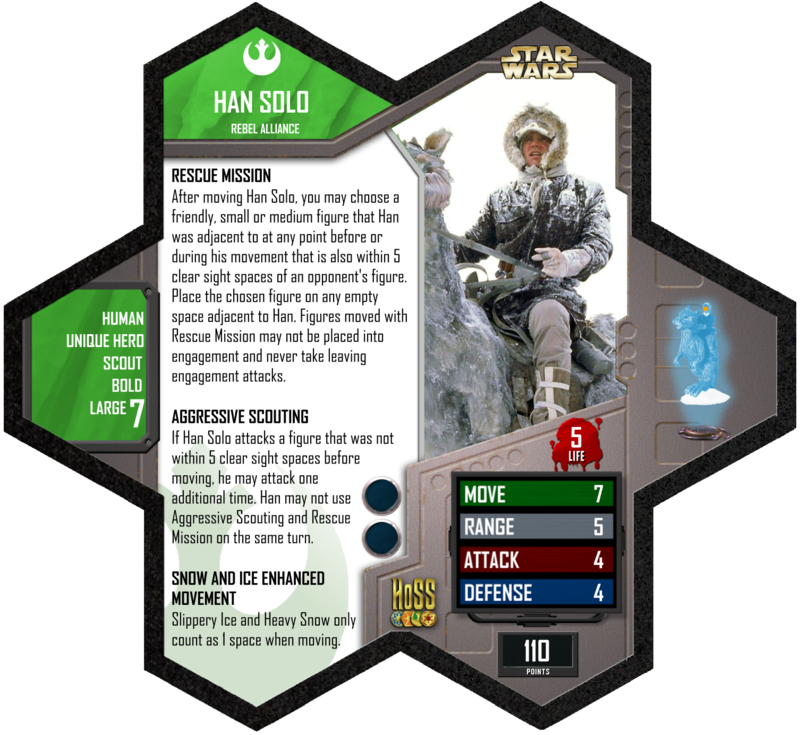 When he prevents a figure from dying, you switch the figures and Han get a new card! $0.02: Han on the Tauntaun kind of feels like a filler figure to me. You only see him riding that thing for a few minutes and then he slices it open after it freezes to death and that's the only part anyone ever actually remembers. Han with the coat isn't seen much more than that, but it's kind of like Malibu Barbie. It's Han Solo, but in his Hoth outfit. It's actually Han, and that could justify a more solid unit with a proper point total, but that would compete with original Han Solo. What reason would there be to cut regular awesome Han with another Han? With that said, Han on Tauntaun would be a sweet figure. Tauntaun mini, IMO. Also, please change the thread to say The Design Holocron of Han Solo, on Tauntaun. Thanks! 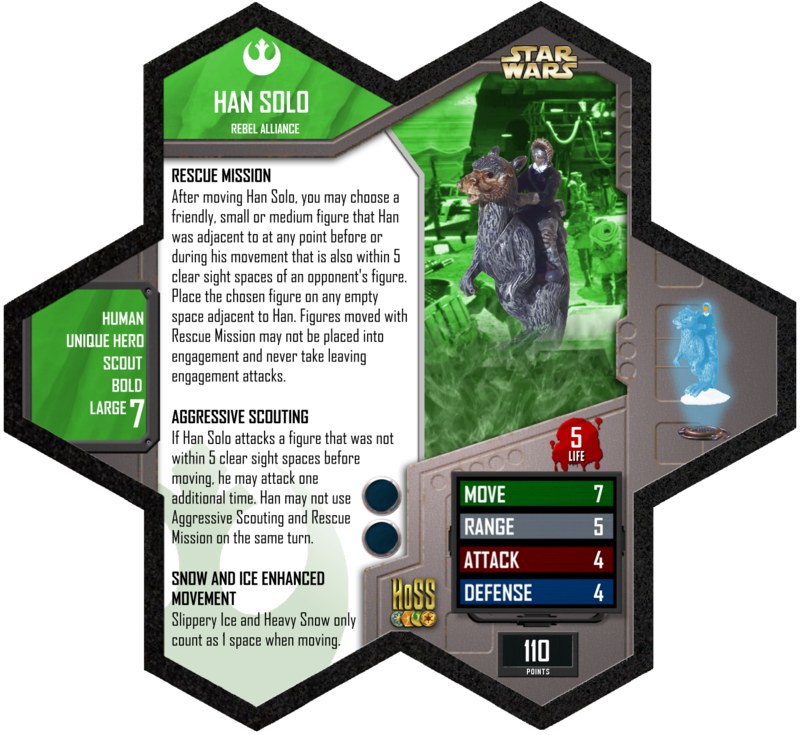 If Han attacks a figure that was not within 5 clear sight spaces when he started his turn, he may attack that figure one additional time. Once per game, when a small or medium figure you control adjacent to Han Solo would receive enough wounds to be destroyed, you may ignore those wounds and remove X wound marker(s) from that figure's Army Card. After using this special power, subtract 2 from Han Solo's move and Han Solo may not use his Snow and Ice Enhanced Movement special power for the rest of the game. 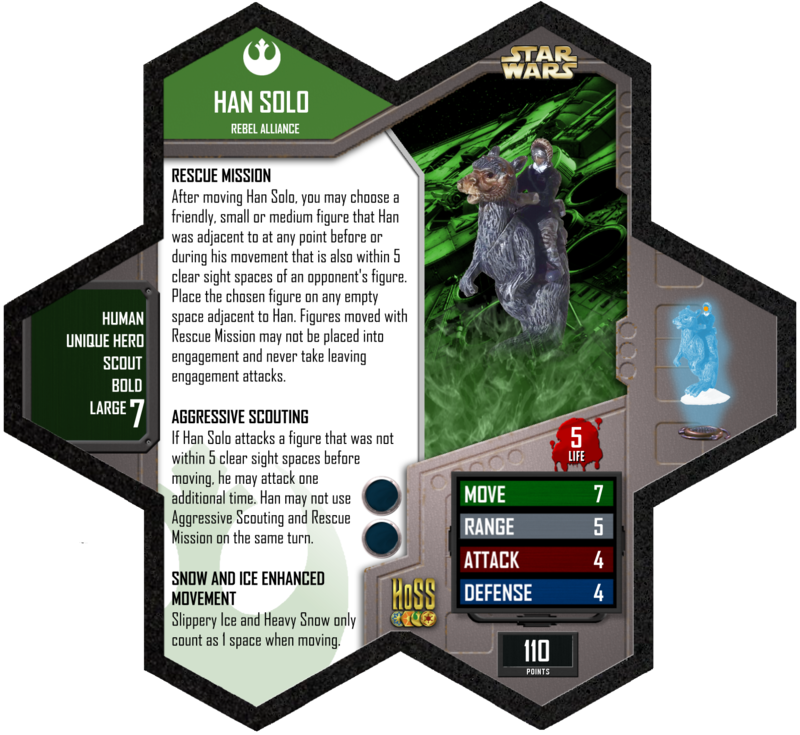 Once per game, when a small or medium figure you control adjacent to Han Solo would receive enough wounds to be destroyed, you may ignore those wounds and remove 1 wound marker from that figure's Army Card. Remove 1 extra wound marker if the figure follows the Rebel Alliance. After using this special power, subtract 2 from Han Solo's move and Han Solo may not use his Snow and Ice Enhanced Movement special power for the rest of the game. Last edited by heroscaper2010; August 28th, 2014 at 09:59 PM. The Tauntaun fits on DW9K base, if I remember right. As long as it's a single-base figure, it would be cool to have an unofficial custom (not custom as in self-made but custom as in a behavior that is usually conducted) of replacing Tauntaun Han with Hoth Han. That being said, I like the ideas with aggressive scouting and killing the Tauntaun to save a friendly hero. Yeah, unofficially with my suggestion (or any power that "kills" the Tauntaun), you could remove the Tauntaun and replace it with normal Han.